All A Bunch Of Momsense: S'More, please? So my BFF sent me this. I think we're going to make them for our New Year's Party. Super easy, and look cute and yummy! 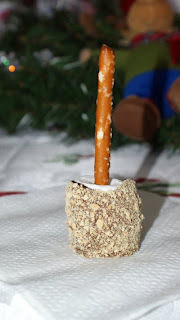 Pretzel stick, stuck inside a marshmallow that's been dipped in chocolate then rolled in crushed graham cracker. Wow! So easy and sounds so delicious! Totally yum! Thanks for sharing! I also thought we could easily replace the pretzel with a graham cracker stick too. Depending on the taste you are after.